We offer both planning and design services for our clients. We understand that every wedding or special occasion should have it's unique style to match your personality or intended theme. Both services are very in-depth, labor intensive and time-consuming. Often the two responsibilities cross paths, which is why our packages cover all of these areas. Below is an overview of some of the key services we provide. We will discuss in more depth our specific packages and detailed offerings at your complimentary consultation in person, over the phone or via FaceTime. Forget about all the ins and outs and let us prepare a professional timeline. This way your family and wedding party don't have to vendor load in/pickup, floral arrival, catering, decor setup, etc. We can produce a vendor timeline and a separate wedding party timeline that we will walk thru at the rehearsal. We find that the budget is the most stressful part of planning a wedding. Most couples have no idea what it will cost and this creates unnecessary anxiety. Wether you have $20,000 or $120,000 allocated for your wedding it can be stressful if you don't understand how the money will be spent. Most couples and parents have no idea what a vendor costs or what is considered average or high. Our team will guide you through the budgeting process and help you stay on track. After the initial design consultation we will setup a collaborative inspiration board. This will allow you to pin the things you love and our design team can share ideas they think go with your theme and colors. Check out the beach wedding board for an example of how this works. You can see all of our inspiration ideas on Pintrest. Once we've gathered all of the concepts and ideas, our team will put together a comprehensive design plan. Our favorite part is generating your custom mood board to communicate colors and key visual elements of your design. 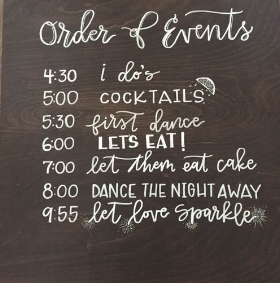 Wedding planners are all about the checklists, organization is key to a flawless event. You will get access to our fine tuned list of tasks broken out by responsibility (us, you or your fiance or parents). Each list will break down tasks by date and timeframe. This will allow you to know what you need to focus on and what we will handle for you. Making sure Jack doesn't get stuck at the same table as Jill can be a nightmare. When you take in to account people who should be seated together and people who should be seated apart things get complicated fast. Lucky for you we've done this like a biz-zillion times. 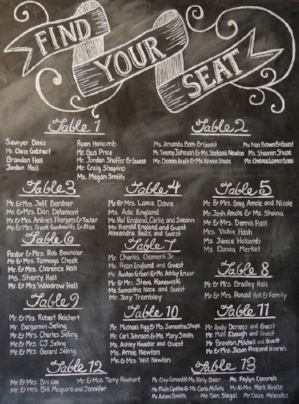 We can put together a seating plan with all preferences accounted for. Our prices are built on a solid foundation of wedding essentials, we know that each couple truly has unique needs (budget, style and personality) which is why we offer starting point prices for our design and coordination services; with our rentals always offered al la carte! We encourage you to research wedding costs and determine what priorities you and your significant other desire. With our professional experience and sought after design skills, our prices are competitive and reflect our knowledge of what quality wedding services cost. We invite you to contact us with any questions and to request our package offerings and look forward to meeting with you.